I hate to do this, but I’m going to take a hiatus. I’m going to take a break until after the first of the new year. Hopefully, by then, I’ll have more of my manuscript written and several young adult books under my belt. Then, I hope to resume the blog in the way I originally intended: as book deconstructions in three parts. I want to thank everyone who’s been reading my posts and I want to wish everyone a happy holidays! I’ll see you after the first of the year with more reading and writing adventures to share! The high tech word cloud is by Lance Shield. click the picture for more of his interesting art. I used to part of an on-line writing community. In some ways it was great. There were published authors available to give writing advice and a place to post snippets of your manuscript. All kinds of people lingered on this message board: spiritualists, atheists, lawyers, scientists, musicians, and even one sailor if I remember correctly. There was a place to post your query letter for critique and places for publishing advice. Most of us were trying to turn out one brilliant piece of writing. Since I hadn’t found my writing group yet, this was a perfect alternative. One of the best things about this community was that it gave me a huge amount of exposure to amateur writing. Plenty of people would find this site, post the first page (or sometimes chapter) of their work in progress and ask for a critique. For a while, my goal was to write three critiques a day. Reading other people’s critiques and doing analysis of my own really helped me to sharpen my writing skills. The first amateur mistake that really started to stick out was wordiness. Megan threw a hurried look over her shoulder and continued swiftly on. Not running. Everyone knew that the worst thing to do when you were being chased was to run. Speed walking. She glanced over her shoulder again. Those eyes, she thought. Red eyes. Adrenaline surged through her body like electricity, leaving her fingers stinging, and she looked for refuge. She hadn’t exactly seen her pursuers, save the eyes, but she heard their menacing calls. A high-pitched, terrifying, inhuman scream that seemed to summon more of them. There had been at least six sets of the glowing red eyes when last she had spied them over her shoulder and, judging from the sound of it, at least double that was behind her now. Can you feel how forced it is? Megan is in a hurry. If you didn’t get that from the two clues in the first sentence, you might have figured it out in the clues in sentence three, four, and five. That’s me, trying too hard to set a scene. In doing so, I take a paragraph that should be fast-paced and manage to slow the progress to a crawl. These days, I’m better at reading my own writing with an eye for extra words. Even when I’m reading published books, I find myself wanting to yank a work here and there because I feel like a sentence would be stronger without it. So what about you? Is there some early lesson that really struck a chord with you? Do you like to write wordy or are you a sparse writer? Do you think writing should launch the imagination or fill in all of the details? I hope everyone has a quick Friday and a great weekend! We carved pumpkins but this one is by boxercab. Click the photo for more art by this artist. I was enjoying Halloween last night rather than writing my blog. I know. Bad Kate. But honestly, we got an adorable little angel and a bunch of other cuties. Also, since we did up our yard like a graveyard and dressed like ghosts, many little kids had to be coaxed up to get their treats! One little ninja brandished his plastic sword when he approached me. Brave little soul! Anyway, I’ll be back on Wednesday, hopefully sans my sugar hangover. I hope your Halloween was as fun as mine! The Michael Meyers mask is actually a re-worked William Shatner mask. It had the longest single shot in movie making (4 1/2 minutes which they actually admit did have one break, but they do have an uncut version of the shot). The movie was shot in California so all of those October leaves are painted Maple leaves that had to be gathered after each shot. The whole thing was made for $325,000. $25,000 of that was Donald Pleasence’s pay. There’s a shot where you can see John Carpenter’s cigarette smoke. 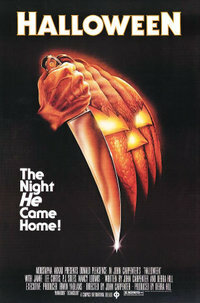 John Carpenter wrote the score. As far as writing goes, this solidifies my belief that simple is best. Think about “Halloween”. Do you remember any extra people on the streets? Was there much in the way of background in the original movie? Think about the score. Just a simple one-fingered melody. Did we need to know motivation for it to be scary? Of course not. Bare bones simple can work just as well, sometimes even better, than all the explosions and CGI in the world. The same is true in a book. In honor of Halloween, tell me about your favorite spooky movie. Is it a simple, terrifying concept like “Halloween” or a more complicated plot, like “The Ring”? I know this is a book blog, but this time of year makes me crave cinema. Have a safe and happy Halloween!